In this list we look at a variety of substances (poisons and venoms) that are normally things we would avoid as they can kill or badly damage us, but are found in the medicine bottles and pill boxes of doctors and pharmacists around the world. Warfarin is an anticoagulant. It was initially marketed as a pesticide against rats and mice and is still popular for this purpose, although more potent poisons such as brodifacoum have since been developed. 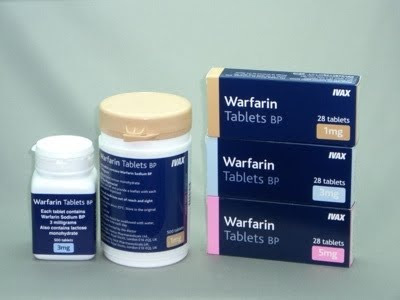 A few years after its introduction, warfarin was found to be effective and relatively safe for preventing thrombosis and embolism (abnormal formation and migration of blood clots) in many disorders. It was approved for use as a medication in the early 1950s and has remained popular ever since; warfarin is the most widely prescribed anticoagulant drug in North America. Despite its effectiveness, treatment with warfarin has several shortcomings. Many commonly used medications interact with warfarin, as do some foods, and its activity has to be monitored by frequent blood testing. 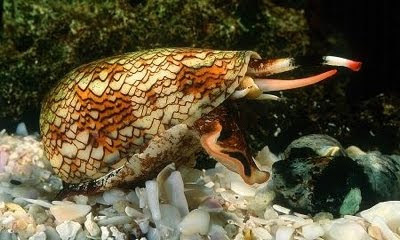 Cone snails are medium-sized to large, sophisticated predatory sea snails. These snails hunt and immobilize prey using a modified radular tooth along with a poison gland containing neurotoxins; this is launched out of its mouth in a harpoon-like action. Live cone snails should be handled with care or not handled at all, as they are capable of “stinging” humans with unpleasant results. The sting of small cones is no worse than a bee sting, but the sting of a few of the larger species of tropical cone snails can be serious or even fatal to human beings. The venom of some cone snails, such as the Magician cone, Conus magus, shows much promise for providing a non-addictive pain reliever 1000 times as powerful as, and possibly a replacement for, morphine. The first painkiller Ziconotide derived from cone snail toxins was approved by the U.S. Food and Drug Administration in December 2004 under the name “Prialt”. Other drugs are in clinical and preclinical trials, such as compounds of the toxin that may be used in the treatment of Alzheimer’s disease, Parkinson’s disease, and epilepsy. The roots of Aconitum ferox (Wolfsbane) supply the Nepalese poison called bikh, bish, or nabee. It contains large quantities of the alkaloid pseudaconitine, which is a deadly poison. Aconitum palmatum yields another of the bikh poisons. The root of Aconitum luridum, of the Himalaya, is said to be as virulent as that of A. ferox or A. napellus. 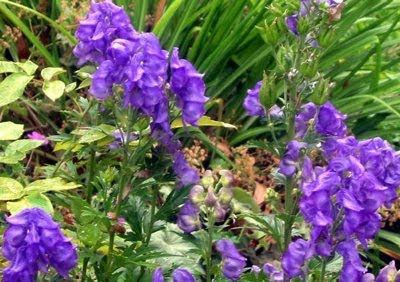 In Western medicine preparations of aconite were used until just after the middle of the 20th century, but it is no longer employed as it has been replaced by safer and more effective drugs and treatments. Internal uses were also pursued, to slow the pulse, as a sedative in pericarditis and heart palpitations, and well diluted as a mild diaphoretic, or to reduce feverishness in treatment of colds, pneumonia, quinsy, laryngitis, croup, and asthma due to exposure. Taken internally, aconite acts very notably on the circulation, the respiration, and the nervous system. The pulse is slowed, the number of beats per minute being actually reduced, under considerable doses, to forty, or even thirty, per minute. Interestingly, the wolfsbane flower was used to identify supposed werewolves. If the flower cast a yellow shadow on the suspected shape-shifter’s chin, the werewolf test was positive. Depending on the species, the digitalis plant may contain several deadly physiological and chemically related cardiac and steroidal glycosides. Thus, the digitalis has earned several more sinister monikers: Dead Man’s Bells, and Witches’ Gloves. 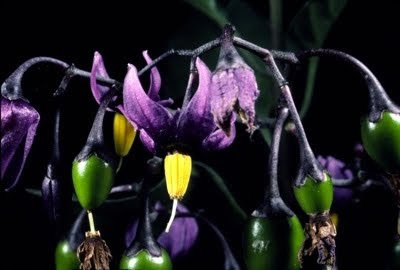 The entire plant is toxic (including the roots and seeds), although the leaves of the upper stem are particularly potent, with just a nibble being enough to potentially cause death. 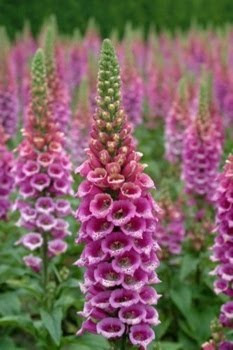 Medicines from foxgloves are called “Digitalin”. It is used to increase cardiac contractility (it is a positive inotrope) and as an antiarrhythmic agent to control the heart rate, particularly in the irregular (and often fast) atrial fibrillation. It is therefore often prescribed for patients in atrial fibrillation, especially if they have been diagnosed with heart failure. The copperhead is an ambush predator: it takes up a promising position and waits for suitable prey to arrive. Like most North American viperids, these snakes prefer to avoid humans and, given the opportunity, will leave the area without biting. However, unlike other viperids they will often “freeze” instead of slithering away, and as a result many bites occur from people unknowingly stepping on or near them. Copperhead venom has an estimated lethal dose of around 100 mg, and tests on mice show its potency is among the lowest of all pit vipers, and slightly weaker than that of its close relative, the cottonmouth. 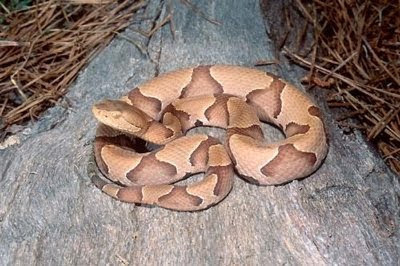 Copperheads often employ a “warning bite” when stepped on or agitated and inject a relatively small amount of venom, if any at all. The venom of the Southern copperhead has been found to hold a protein called “Contortrostatin” that halts the growth of cancer cells and also stops the migration of the tumors to other sites. It will probably be ten or more years before contortrostatin is used in practical treatment but it has shown to be a novel anti-cancer drug in the lab. 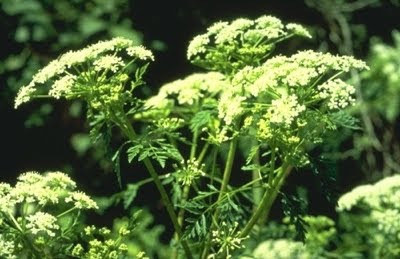 Hemlock is one of the most widely known poisons. The most important and toxic alkaloid in hemlock is coniine, which has a chemical structure similar to nicotine. Coniine is a neurotoxin, which disrupts the workings of the central nervous system and is toxic to humans and all classes of livestock. Coniine causes death by blocking the neuromuscular junction in a manner similar to curare; this results in an ascending muscular paralysis with eventual paralysis of the respiratory muscles which results in death due to lack of oxygen to the heart and brain. Death can easily be prevented by artificial ventilation until the effects have worn off 48–72 hours later. Ingestion of Poison Hemlock in any quantity can result in respiratory collapse and death. For an adult the ingestion of more than 100 mg of coniine (approximately 6 to 8 fresh leaves, or a smaller dose of the seeds or root) may result in fatality. Despite its deadly reputation, poison hemlock has been used as a sedative and for its antispasmodic properties. It was also used by Greek and Persian physicians for a variety of problems, such as arthritis. Atropine is a tropane alkaloid extracted from deadly nightshade, jimsonweed (Datura stramonium), mandrake and other plants of the family Solanaceae. Injections of atropine are used in the treatment of bradycardia (an extremely low heart rate), asystole and pulseless electrical activity (PEA) in cardiac arrest. Atropine’s actions on the parasympathetic nervous system inhibits salivary, sweat, and mucus glands. This can be useful in treating hyperhidrosis, and can prevent the death rattle of dying patients. Because of its extremely important use in medicine, this poison is a core medicine in the World Health Organization’s “Essential Drugs List”, which is a list of minimum medical needs for a basic health care system. The venom from another menacing arachnid is being used to help treat cancer. 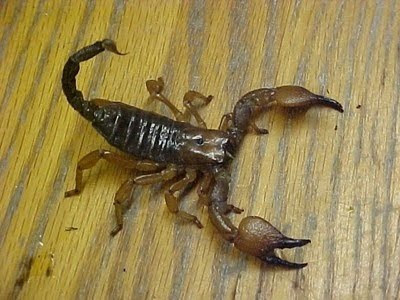 Researchers at the Transmolecular Corporation in Cambridge, Mass., have isolated a protein that occurs in the venom of the Israeli yellow scorpion. This protein has been shown to seek out and bind itself to the types of cancerous cells found in gliomas, a type of brain cancer that’s particularly difficult to treat. The researchers created a synthetic version of the protein and attached radioactive iodine solution to it. When introduced into the bloodstream, the protein seeks out glioma cells and binds to them, carrying the radioactive solution along for the ride. The solution then destroys the cells — and with enough treatments, the cancer. 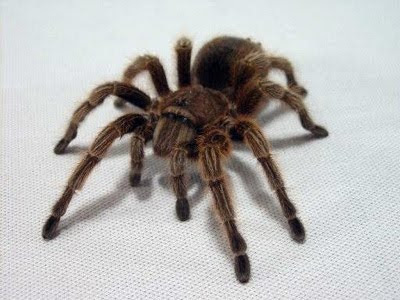 Biophysicists from the University at Buffalo are using a protein from the venom of the Chilean Rose tarantula to combat death from heart attacks. The walls of your cells have tiny channels that open when the cell stretches. Among other body functions, these channels are responsible for the contraction of heart muscles. When these channels open too wide (which can happen from stretching the heart muscles over time), they allow a flood of positive ions into the cell. These extra ions disrupt the electrical signals in the heart, causing the organ to fibrillate (beat wildly and irregularly). The protein from the Chilean tarantula venom binds to these channels, which can block the positive ions from passing through. This could ostensibly prevent fibrillation — and hopefully death — if delivered during a heart attack. 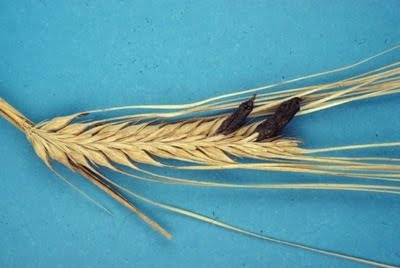 Man has a long history with ergot – a fungus which infects rye (which is then transferred to humans who eat the grain). Ergotism causes hallucinations and attendant irrational behavior, convulsions, and even death. Other symptoms include strong uterine contractions, nausea, seizures, and unconsciousness. Consumption can lead to amputation of limbs which are damaged by the fungus. Since the middle ages, controlled doses of ergot were used to induce abortions and to stop maternal bleeding after childbirth. Ergot alkaloids are used in products such as Cafergot (containing caffeine and ergotamine or ergoline) to treat migraine headaches. It is also used in a variety of treatments for Parkinson’s disease. Ergotism has even been blamed (though it is not likely the true cause) for the extremely bizarre dancing plague which struck Europe in the 1500s.